I was pretty upset when I went to my 20 year high school reunion in September and found out that our good ole woodshop teacher was gone. Mr. H with the obligatory missing finger tip on his left hand, taught many a student how to make shelves, wooden ducks and candle holders. After school though we built penny hockey boards, rubber band, potato and marshmallow guns. If you could make it out of wood and somehow shoot with it, we made it. Didn’t you? Well I’ve come to find that woodshop is all but gone. Apparently they’ve sent all the woodshop teachers over to Sweden and China. All meandering aside, in some high schools, what’s taking the place of woodshop are 3D printers. This move of course makes a lot of sense. But let me tell you if I had access to a 3D printer I can safely say I probably would not have had the technical know how, or thought to do what 18 year old Tim Liu and 17 year old Aimee Kalczuk and the robotics team at West Catholic High School in Michigan did. Business Insider reported on Friday that these two students, along with the rest of the robotics team, heard about 4 year old Harmony Taylor. This vivrant young lady has all the makings of a normal four year old girl. Except for the fact that she was born with “limb differences” that caused her fingers on her right hand not to form correctly. In fact the fingers on her right hand never developed at all. 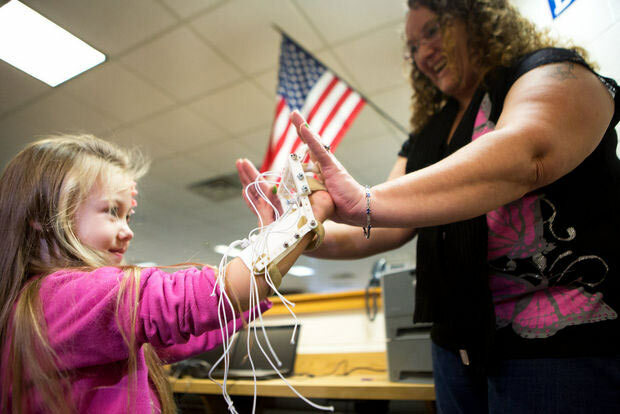 The students in the robotics club at West Catholic High School made young Harmony a robotic hand that slides onto her arm and is easy to control. The students gave her the hand for Christmas along with a gift bag. Harmony was able to pick up the bag with her new hand. “I am so excited because this is going to make her more independent,” her mother, Melanie Peterman, told MLive. Harmony had previously had a prosthetic hand that cost around $5,000 however her mother said that all that hand did was allow Harmony to pinch. “There are things like tying her shoes and playing certain games at school that you kind of need two hands for. ” Peterman said. The entire project was organized by Harmony’s’ preschool teacher Betty Krzyszton who found out about the possibility for a robohand on the internet. She pulled all the players together including the students and The Mary Free Bed Rehabilitation Center in Grand Rapids. The students were thrilled to be able to help Harmony. “We usually are building robotics or playing games but when you can actually help people and use the things that we’ve learn from robotics in a real world situation, it just feels really great,” Kalczuk said. The gift bag contained some pink nail polish. Harmony said she couldn’t wait to paint her nails.